So my journey with Netsmart began back in October of 2014 on my first day walking into the main Kansas building. I decided not to be shy, and introduced myself to the five other people that would start with me that day. I think that automatically made me Amy, the chatty one, in the group. We soon learned more about our roles and starting on day two, we dove right in and spent the next few weeks learning. We shadowed other associates and trained one another over what we had learned. We studied the modules, programs, events, and setups while testing each other on a daily basis. After having spent a lot of time in the Clara Barton (pioneer nurse who founded the American Red Cross) training room, I was ready to get going. Of note, all of our conference rooms have @CauseConnected names. Hi, I’m Hannah – pictured closest to the Netsmart sign. Pictured to the right is Zach and then Amy. 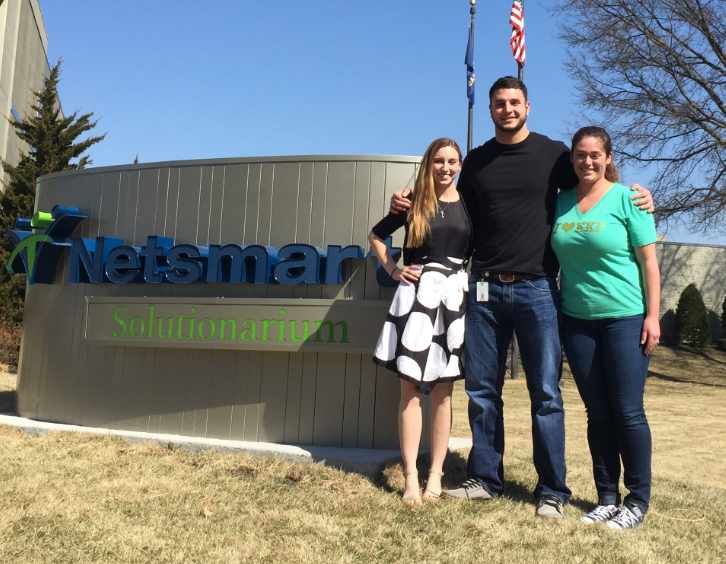 Our Netsmart journey began about 10 weeks ago as we were welcomed into the Consulting Organization. We will each share our story over the next few days starting with mine today. So check back to hear their stories. Here’s mine: I had a technical background which made it a perfect fit for me. We attended four weeks of training; allowing us to have a lot of specialized attention and really focus on the areas we didn’t know or had not had experience with before starting employment. After we finished training, I had the opportunity to work on updating the Training Manual; this allowed me the chance to review everything from training as well as improve upon the training exercises for future new hires. It was a great experience and I was able to improve on areas that were a weakness for me.